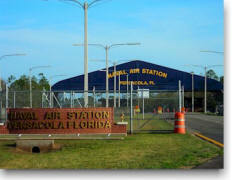 Pensacola NAS is located in Pensacola, FL on the Florida Panhandle. Pensacola NAS houses Navy Flight Demonstration Team (Blue Angels), Chief of Naval Education and Training, Naval Air Technical Training Center and Training Air Wing 6. There are over 11,000 active duty and more than 4,000 civilians on base.